Marcus Shelby, the composer and bassist, told this and other stories Friday night at a celebration of Dr. King’s 81st birthday at the Red Poppy Art House. At a compelling concert intertwined with African American civil rights history during 1955-1968, the Marcus Shelby Quartet performed Shelby’s rearrangements of music from King’s era. 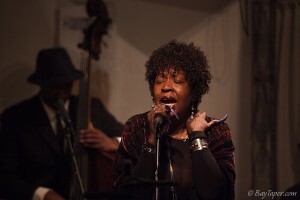 The powerhouse ensemble featured blues and jazz veteran Faye Carol on vocals, Howard Wiley on tenor saxophone, pianist Adam Shulman, and Jeff Marrs on drums. A week ago the program, “MLK and Jazz” made its Los Angeles premiere at the Skirball Cultural Center, a venue that seats 300. 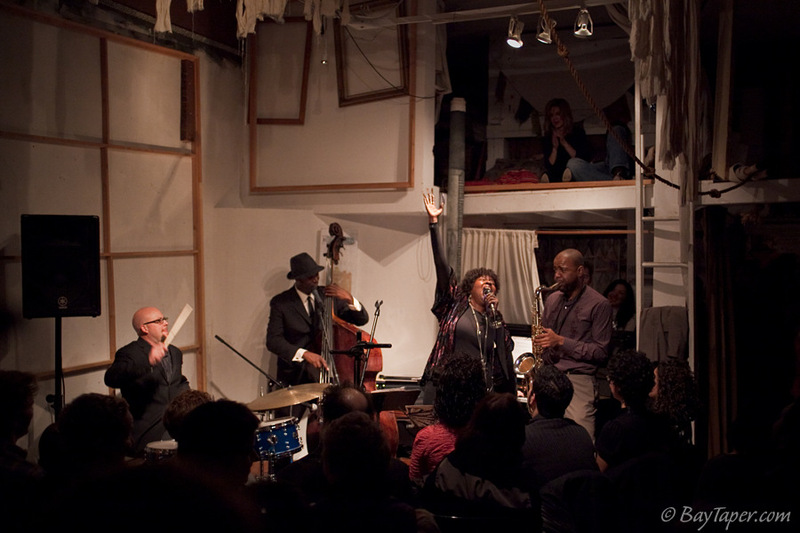 Inside the small space of the Red Poppy Art House, the audience overflowed into standing room behind the stage; a few sat above in the rafters. “Primo, primo ears,” vocalist Carol later complimented the audience. The show began with the civil rights movement anthem “Ain’t Gonna Let Nobody Turn Me Around,” arranged by saxophonist Wiley. The music soared, the solos uplifted. Described as “the quintessential new traditionalist,” Wiley one of the finest tenor sax players around (and I mean the entire world), gigs bi-coastally. At the same time, he’s crafting “The Angola Project” as a resident artist with Intersection for the Arts in the Mission. Between tunes, Shelby stepped up to the mic to music’s role in the civil rights movement. Galvanizing and unifying, protesters sang songs on picket lines, at mass meetings, sit-ins, voter registration campaigns, and in jail cells. “In essence, King said that the freedom songs and spirituals were the ‘soul’ of the movement,” Shelby said. Music also reflected the political climate of America. When politician and Ku Klux Klan member Theodore Bilbo died, Andrew Tills composed the 1947 blues song “Bilbo is Dead,” a derisive, straight-faced lament. John Coltrane wrote “Alabama” and Nina Simone, “Mississippi Goddam” in response to the September, 1963 16th Street Baptist Church bombing. In the 1940s, jazz was already moving away from the pop music of Swing, to less comfortable, more musically complex territory like bebop. And as activists began risking life and limb for civil rights , African American artists responded. At the Red Poppy, Faye Carol sang a profoundly harsh and haunting rendition of “Strange Fruit” a song made famous by Billie Holiday in 1939. Its lyrics capture the imagery of lynched bodies swinging on Southern trees. Charles Mingus’ tune “Fables of Faubus” was also played, with Carol singing the politically charged lyrics banned by Columbia Records in 1959. They condemn Arkansas Governor Faubus for sending armed National Guards to prevent black students (“The Little Rock Nine”) from attending a high school. In 1958, more than 10,000 students participated in the Youth March for Integrated Schools in Washington, DC. The following year, more than 25,000 students participated in a second march and rally. In 1963, more than 33 teenage girls were arrested during a march in Americus, Georgia. They were locked up in the Leesburg Stockade with no running water, a stopped up toilet, barred windows and a cold cement floor to sleep on. “Somehow a photographer heard about this ‘secret prison’ and broke his way into the prison, discovered this horror, and snapped pictures of the locked up girls and the conditions of the cell.” Shelby said. “These pictures helped draw focus on the injustices that were happening, and eventually the girls were set free. Eloquent in phrasing and assured in tone, Shelby’s musical qualities crossover to his lecturing. He’s also an instructor at the Berkeley Young Musician Program, San Francisco State University and the Stanford Jazz Workshop. “MLK and Jazz” and “Bound for the Promised Land: Harriet Tubman,” an original secular oratorio Shelby composed, have been developed into educational workshops for schoolchildren and older students. 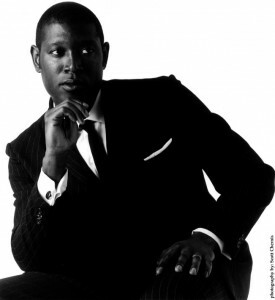 BayTaper.com posted an excellent multimedia piece of Marcus Shelby Quartet performing Billie Holiday’s “God Bless the Child”.